Richmond Express offers different types of services for our clients' different needs - 24 hours a day, 7 days a week. Standard Delivery - Pick up and deliver within 2 hours. Any package picked up and delivered within metropolitan Richmond will be delivered within 2 hours of call in time. Any package going outside of the Richmond area will be picked up within 1 hour and delivered directly. Rush Delivery- Pick up and deliver within 1 hour, how about that for "rushing"? Any package picked up and delivered in metropolitan Richmond will be delivered within 1 hour of call in time. Pick up and deliver at the same time each day or each scheduled day. Our truck work can be scheduled or we can send one out as soon as a truck becomes available. 90% of the box truck work performed in the Richmond area is completed within 3 hours. 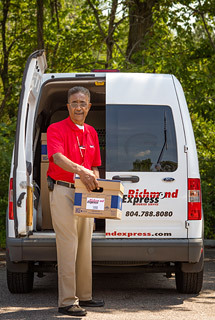 Richmond Express delivers to every county in the state and every state in the union. We charge by the mile one-way, and your parcel is usually picked up within 1 hour and delivered directly. Customers can place orders on line with our internet ordering system. Don't have an account? Call us today and we will get you set up with login credentials! Orders placed for service between 6:00pm and 8:00am during the regular work week. Orders placed for service after 6:00pm on Friday and before 8:00am on Monday. We operate on all holidays, including Christmas, Thanksgiving, Fourth of July, Memorial Day, Labor Day and New Years Day. We have four-wheel drive vehicles to deliver in the deep snow. If your package must get there, we are ready!